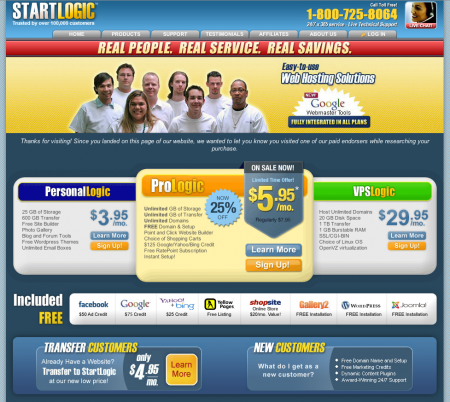 StartLogic is a well known hosting company that offers both shared and VPS hosting plans. They offer three different Linux based VPS free trials. If you need Windows based VPS to run any of your website applications, then we recommend MyHosting.com's VPS free trial. Using StartLogic VPS, you can host an unlimited number of websites and domains. All StartLogic plans come with a 30 day money back guarantee, so you can try their services for a month before you decide whether or not you want to continue using them. *The pricing listed here is based on a one year term, which comes with a 10% discount. Three and six month term commitments are also available, but the three month plan requires a $30 setup fee. All plans come with at least $50 in Google Adwords and $50 in Yahoo & Bing Search credits. The VPSLogic Premium plan comes with $75 in Adwords. StartLogic's VPS free trials are an excellent choice for small businesses who do not want to pay a premium to have the flexibility of a month-to-month basis, but are not ready to commit to a year's worth of hosting.